My friend Deb Z. posted this article on Facebook, and I think it’s actually pretty important for women to read (and Men to roll their eyes at). It’s not that insurance companies are sexist. Or that they expect all of their female customers to go barefaced and disheveled. 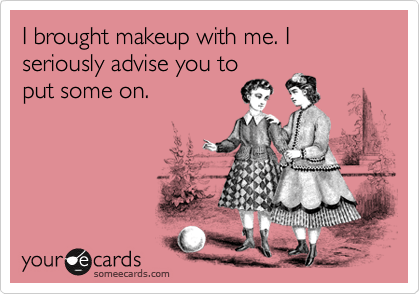 But if you use your commute as makeup application time, you’re a crash risk. In fact, applying makeup is actually more dangerous than dialing a cell phone–it’s the fifth likeliest task to increase crash risk. Talk about a dangerous tube of MAC lipstick. According to Nancy Germond, an insurance expert from Phoenix, AZ, an insurance company might “forgive” your first auto offense if you have a good driving record. 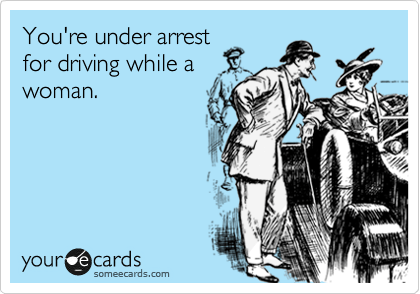 Otherwise, if the accident is deemed to be your fault, you can expect your rate to take an upward hike. The number of separate accidents you’ve had is more important than the amount you’ve racked up in insurance claims, says Miller. A single accident may raise your rate $100 to $200 a year, whereas a second claim increases it by much more and a third will probably bump you into a higher price tier entirely. Miller explains, “Frequent accidents make insurance companies believe you’re likelier to have other accidents down the road.” On average, Insurance.com told us, “drivers with no violations pay $1,119 annually for car insurance. By contrast, drivers with three violations pay $1,713.” So, if you end up regularly filing claims because of that eyeliner habit, you’ll be paying way more than the cost of new makeup in the end. Source: I have no idea, but the above statistics were previously printed. I must admit, I used to be guilty of this “crime”. When I used to drive downtown everyday, there were times when I caught myself applying make up while driving (I know, totally stupid). I was broken of that habit, when the driver behind me, and we were indeed clipping along at a pretty good pace, Honked his horn, and when I looked back at him in my rear-view mirror, he gave me a “Thumbs Up”. Nice. Ugh. Totally embarrassing, and I have to say, that was Many years ago, and I basically haven’t done it since. 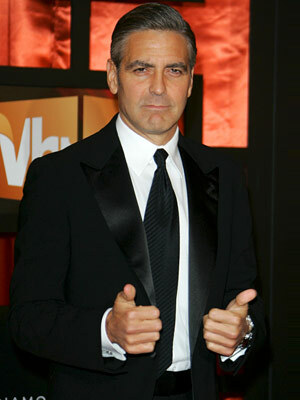 Applying Lipstick or Lipgloss – I think we are a-okay here! Applying lip gloss is no different from changing your radio channel. 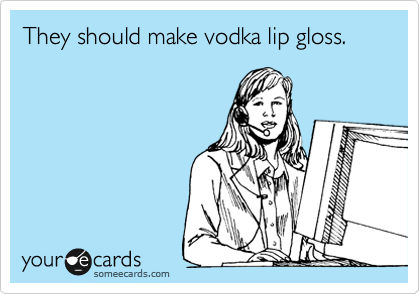 Of course, I apply mine without having to look in a mirror, by just dabbing the gloss on my lips. If you need to look into a mirror, do NOT do it. 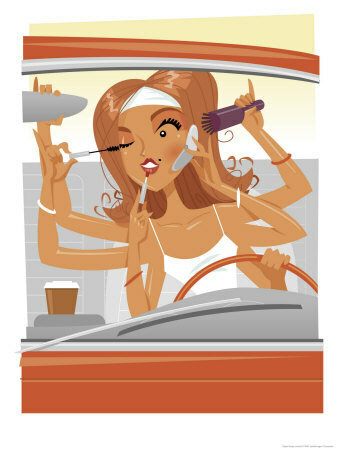 Driving is complicated and dangerous enough, with everyone talking on their phones , texting (YIKES, but it does happen), drinking coffee and Smart Water, changing the iPod setting on your radio to replay Build Me Up Buttercup on repeat…don’t make it even worse, by applying your make up. 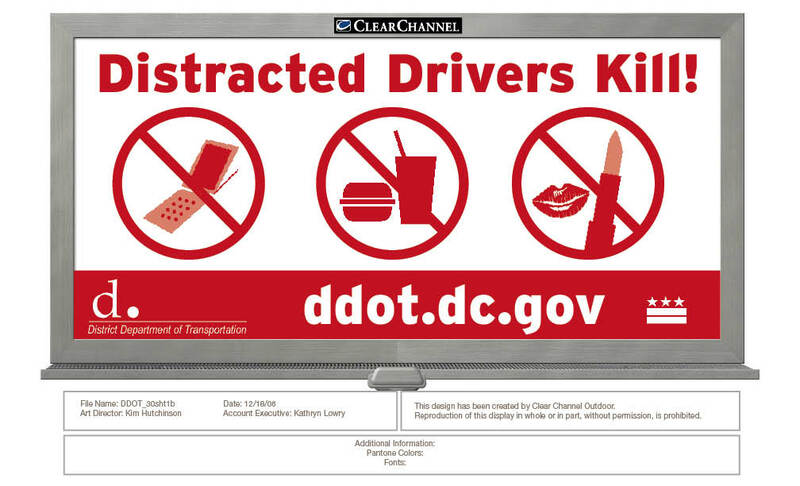 Wait until you are parked (and not at a stop light either) to do what you couldn’t do at home. Ha ha I like the cartoons. OK, I pass your test…mostly just applying lip stick and lip gloss. Well, guilty of a little cover up, too. I think what’s more challenging than looking in the mirror while focusing on driving, is trying to feel around in my purse for the lipstick or lipgloss based on shape and feel of the tube. So, now I have an extra lipstick I keep in the cup holder for a quick touch up. Just think of how many lives I’m saving! I am pretty sure plucking eyebrows and chin hairs in the car using the tweezers kept in the glove compartment is completely permissible when one is in one’s driveway or has parked the vehicle. After all, we all know this is the best light to discover that you have a few (!) teenage boy looking whiskers under your chin….sigh. But never while moving! You wouldn’t hear a complaint from me! shall we start a new business? Say, was this a repeat? I seem to remember some of these comments….there’s even a buttercup reference! Thank goodness the gloss thing is okay.